For ten years I have been raising animals, at first pigs, lambs, goats, and chickens (laying hens and broilers), then ultimately just pigs, to kill so that we can eat their meat. At first, I went sporadically, but for the last five years, I have loaded pigs, anywhere from two to fifteen, onto the livestock trailer at least once every week and have delivered them to the slaughterhouse, where within minutes, or perhaps hours, they were killed, eviscerated, split in half lengthwise, and then rolled into a cooler to chill the still-warm-from-life carcasses down to a food safe – they are, or had become, been made into, food – temperature. Eventually, the pigs, their carcasses, have made their way to butchers, to restaurants, to local-centric farm stands, and to individuals' homes, mine included. Each of us, that is, the people who purchase my pigs and I, have a myriad of ways of justifying raising animals to kill so that we can eat their meat. Some of those myriad ways are the same, some are different. All of them, however, include two key, and related, justifications: the pigs had good, many, including I, would say happy, lives; the pigs had quick, painless deaths. In other words, all of us to some important degree, care about the welfare of the pigs. 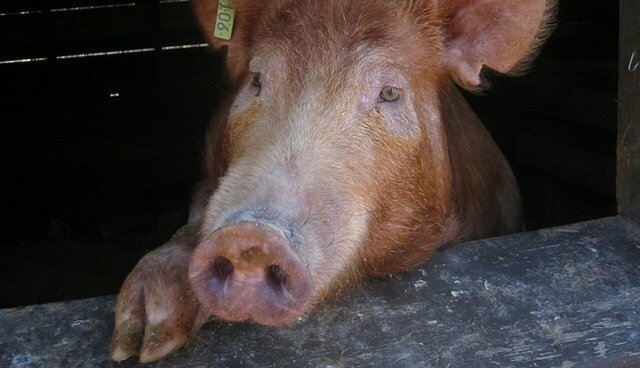 We acknowledge their sentience, their intelligence, their great capacity for suffering, their many and varied interests, and we believe that it is incumbent on us – as farmers and consumers – to ensure, to the best of our abilities, that those attributes of pigs are not violated in any way, although we readily allow what we consider insignificant and necessary violations, like castration without any anesthetic; like being forcefully weaned from their mothers before the piglets or the mothers are ready for the weaning to take place; like herding them onto a trailer and then off of it into a new, strange, and therefore stressful place; like killing them, albeit quickly and painlessly. On and off, I have struggled with the ethics of raising animals to kill them so that we can eat their meat. At times I have felt a great deal of guilt. At times I have felt a great lack of confidence that what I was doing was okay. On the other hand, at times I have felt a great deal of satisfaction, and even pride in what I do. No matter how I have felt, there has always been one abiding truth: in the slow paced, quality slaughterhouse that I use, at the moment of their deaths, the pigs do not suffer, not even for an instant. They stand there, with all available anecdotal, and even scientific, evidence saying so, completely oblivious. Then they are stunned, either with a captive bolt gun discharged against their forehead, or by high voltage electricity concentrated on the brain, and then, unconscious, they are killed. In my experience, this is a truth, and it is abiding. However, there is more to the humaneness of a slaughterhouse than how the pigs are killed, or even how the pigs are handled in the pens. There is an issue, what amounts to a major failure of the humane slaughter system as it relates to the slaughter of pigs, that needs to be addressed. It is the issue of the last pig, and the issue of the last pig calls into question whether these slaughterhouses are humane (whether slaughter can ever be humane is a subject I would more than willingly take up another time). The issue of the last pig has troubled me for years, but I have never voiced my concern about it before, to anyone, primarily because I didn't want to shine a negative light on what should otherwise be our model for slaughtering animals. Times are changing, however. People are beginning to challenge the sanctity of the non-factory farm livestock raising and slaughtering system, as well they should, as neither the raising nor the slaughtering live up to the idylls that their proponents, myself included, tell about them. The grotesqueries of industrial slaughter, through the dangerous work of committed activists, have been successfully brought to light. While far from grotesque, it is time that the fact that there are issues with non-industrial slaughterhouses also sees the light of day. I believe it is especially important considering how it is clearly taken for granted, literally without question, by the proponents of non-industrial slaughterhouses, only a fraction of whom have ever even been inside of any type of slaughterhouse, that they are humane, in every way, in the acts they carry out. One time a few years ago, when I went to one of the slaughterhouses that I used to use to pick up some boxes of pork from the pigs I had dropped off the week before, one of the slaughterhouse workers told me that the femur of one of the hind legs of one of the pigs had been broken, so that was why I would find that one ham had been de-boned. None of the pigs had been limping or anything when they got off the trailer and walked into the pens the week before, so I asked him how he thought the pig's leg might have been broken. He said, "I'm not sure. Maybe a pig shot up on top of it trying to get away from so and so slaughter worker when he went into the pen to pull the next one and the pig's leg slipped out and broke under the weight of the pig on top of it. Or, maybe it was the last pig in the pen." He didn't elaborate on that latter possibility. He didn't have to. Over the years, I have seen plenty of last pigs in the pen at slaughterhouses. I knew exactly what he was talking about. Pigs live in groups, but they are not herd animals in the traditional sense of the phrase. Pigs live in groups not only because they find safety and comfort in numbers, but because they are intensely, and I believe quite consciously, gregarious. It is instinctive for them to form and live in groups (just as it is for humans), but it is not only brute, thoughtless instinct. Pigs like being with other pigs. They like to socialize, to hang out, to eat together (if you watch pigs eating together for long enough, it becomes apparent that they "break bread" together; they don't just eat near and amongst each other), and they like to snuggle when napping and sleeping (a sleeping pig is nearly always in physical contact with another pig; if it is not, it is likely ill or injured). Their social bonds run deep, perhaps not as deep in a conscious way, at least not as obviously so, as elephants, cetaceans, or the great apes, but deep nonetheless. When those bonds are broken, a pig suffers a tremendous amount of psychological stress, most often expressed in repeated deep, long, doleful groans, and when the circumstances are right, pigs express that psychological suffering (stress is an inadequate term) of broken bonds by totally and completely flipping out. They run back and forth squealing. They run aimlessly, in circles, screaming. They will jump fences, or they will plow right through them. When confined in a tight space, they will smash themselves against walls and gates, repeatedly. They will spastically chew on metal bars. They will try to climb whatever can be climbed. They will jam their snouts under the bottom rung of a gate over and over again and strain and struggle to lift it off of its hinges. They will smash themselves against the walls and gates again, repeatedly. You know where circumstances are just right for pigs to go dangerously ballistic? In pens at slaughterhouses. One by one as the day at the slaughterhouse passes, pigs are pulled out of pens with groups of pigs in them, until there is one last pig left in the pen. Not always, but very, very often, that last pig loses it as described above. Regardless of whether the last pig completely loses it, it begins to suffer the moment it is alone. Sometimes, in their hysterical efforts to free themselves in order to find other pigs to be with – because that's what it is all about – last pigs are so frantic and have become so mad under the strain of their psychological distress that they will hurt themselves. When trying to climb a gate with multiple evenly spaced thick round rungs, for example, a hind leg might slip through and get caught, and when the pig ultimately gives up trying to climb and comes back down, or just slips and falls back down, that stuck leg might break. Do such injuries happen often? No, but it happens often enough that it occurred to the slaughter worker to offer it as a cause of that one broken leg without any explanation needed. And, besides, does it only matter whether the last pig gets injured? Isn't the extreme psychological suffering experienced by the last pig enough in and of itself? Shouldn't that be enough to give us pause? Shouldn't that be enough for us to question whether or not humane slaughter – the entire process, from first pig to last – is humane at all? The horrific experience of the last pig only lasts a few minutes before it is the last pig's time, and when the last pig's time comes, it too will drop like a stone. But, God, what a last few minutes to live through. If you need an analgous image, picture a person, a human being, being held captive at the bottom of a dry well, like in the movie Silence of the Lambs, hysterically and insanely trying to claw their way out, oblivious to the extreme pain of broken and torn finger nails, of blood-slick fingertips scraped down to the bone. If you can picture that, you've caught a glimpse of the last pig, and there is always, every day in every slaughterhouse, no matter how humane, a last pig. For dramatic effect, I would, of course, like to end there. But, that would be irresponsible because the point of this piece is to draw attention to a current failure of the humane slaughter system. While at this point in my life I would like us to stop killing animals so that we can eat their meat altogether, I acknowledge that this is not going to happen, not in my lifetime anyway, so I admit and support a workable alternative to the unending horrors of industrial slaughter, the small-scale, slow-paced, quality slaughterhouses that many, if not most, of us local farmers use. I have never seen cruelty or abuse in any of the six different small slaughterhouses I have used over the years (this is not to say that such cruelty and abuse does not happen, only that I have not witnessed it). I have never seen an animal in one of these slaughterhouses suffer for even an instant on the kill floor. The only failure I have seen in them is the one I have just described, and it is a failure that can be remedied. I am not sure exactly what that remedy would be, but one thing that comes to mind is to set up the slaughterhouses so that there is no last pig. That is, the last two pigs in a pen should be killed simultaneously. Whatever the remedy, for the sake of the last pig, and for us, there needs to be one.